The school children come to the opening ceremony. This has also been an amazing year for Mission 4 Water. They have completed another 16 wells, bringing the total to 61 to date, providing clean and safe water for more than 16,000 people, many of whom are school children. Sue, Sunday and the team have travelled extensively, deep into the villages where conditions have sometimes been very challenging, but the reward of seeing the joy on peoples’ faces as they pump clean water for the first time is so exciting! Wishing everyone a very special Christmas; one filled with the sure knowledge that no matter where we are in the world, we are all children of the same heavenly Father. May your Christmas be joyful, peaceful, and blessed! This entry was posted in news on December 23, 2014 by Sue Morgan. 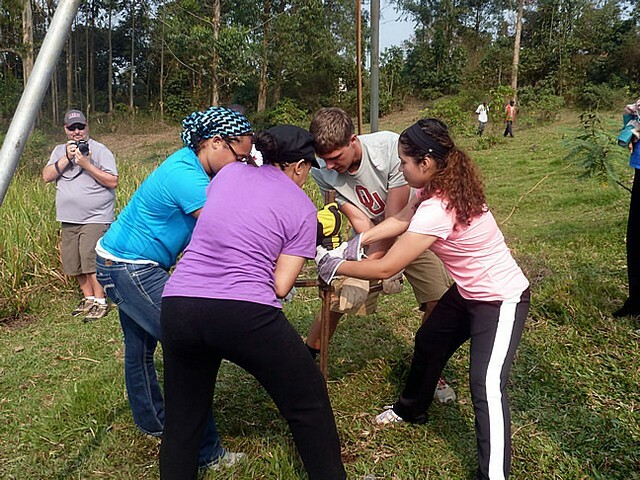 For the 4th year Mission 4 Water have welcomed a team of volunteers from Mid American Christian University in Oklahoma, USA. The team of 6 raised the necessary funds to sponsor a new well for Mikkola Nursery and Primary School and the surrounding community of Rwakabengo, near Rukungiri. Beforehand the people would collect dirty and contaminated water from a pit in the swamp, shared with the animals it would dry up in the mid morning, and so the school kids were then forced to walk 2km each way to a ditch. This was the water that was used to cook lunches and wash the dishes. After 8 days hard work and a good team effort, the new well was completed. At the handover ceremony, attended by 266 school children and staff and many community members, Engineer Sunday taught them about hygiene issues and trained them how to take care of their new water source. The volunteers then presented gifts of new jerry cans to them all in which to carry their clean water. One elderly lady collected her new jerry can and danced all the way back to her seat , singing for joy as she went. The gift of clean water is just about the best gift anyone could ever receive! Praise God! Dancing for joy at the gift of clean water. Yet again we are indebted to those who help us in our work by sponsoring and digging new water wells in Uganda. If you feel inspired to help please visit our volunteering page or find out more details on donation in our how to donate section and we will be happy to explain how you can get involved. This entry was posted in news on July 28, 2014 by Sue Morgan. 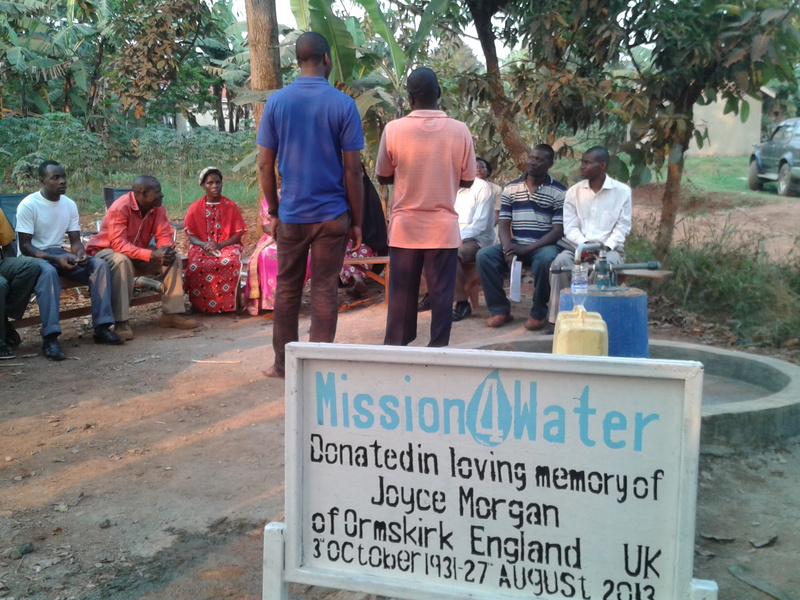 Donations in lieu of flowers at the funeral of Sue’s Mother-in-law who suddenly died in August 2013 were given to Mission 4 Water to produce a well for the rural community at Katale, a suburb of Kampala. Previously the people fetched water from the swamp way down the hill. Thank you to the friends and family of Joyce Morgan for this life-giving gift. Surely a fitting memorial that would greatly please her! This entry was posted in news on May 21, 2014 by Sue Morgan.